Dear friends of the Alumni del Cielo community! Cerea! I am happy to receive you on the occasion of the 50th anniversary of the foundation of your Association and on the 10th anniversary of the death of your founder, the Jesuit Father Giuseppe Arione. To you all my warm welcome! Your associative reality, divided into two groups, Revival and Amen, is inserted in the ancient and prestigious "Social Institute" of Turin, whose educational purpose is enriched by the spiritual experience of St. Ignatius of Loyola. 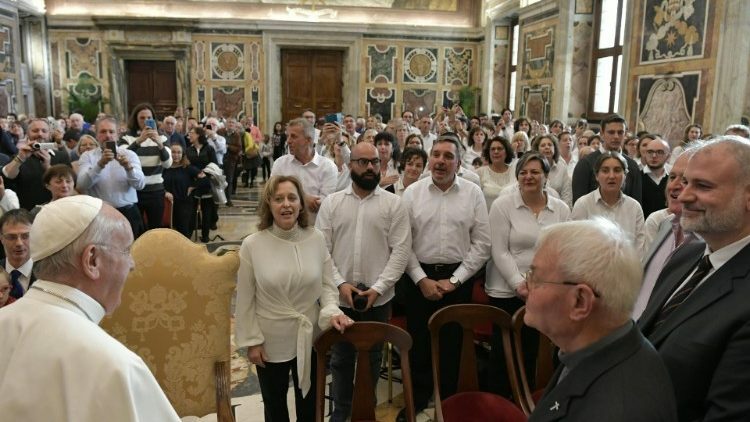 With the help of your Assistant, Father Piero Granzino, you commit yourselves to witnessing the Gospel with music and singing to reach the hearts of everyone, even those who are far from the Church or faith. Your mission is carried out in the wake of the charism and testimony of Fr Arione who, realizing the guidelines of the Second Vatican Council for a Church in dialogue with the contemporary world, in 1968 opposed the attitude of acceptance to the protest. He dedicated himself to a form of apostolate that used music and song as languages ​​capable of transmitting in a universal way the beauty and strength of Christian love. He went "to the crossroads of the streets", even in places previously unexplored by the Church, to meet the boys and young people where they gathered and organized themselves. To all, without distinction, he addressed himself with empathy and benevolence, proposing a journey of faith and fraternity. The aim was to evangelize with the song, proposing a faith that announces and sings the love of God, generating friendship and fraternal sharing. I encourage you to carry forward the charism of this generous Jesuit, renewing it in its forms but preserving its prophetic inspiration, which is still valid and current. To do this, it is necessary to take care of one's inner life, without letting it "steal" from the worldly noise, but cultivating it through personal and community prayer, listening to the Word of God, assiduous participation in the sacraments, especially to Confession and 'Eucharist. Thus, your voices and melodies will not only be pleasing to the good musical taste, but, enriched by your testimony of Christian life, will favor in those who listen to you the desire for communion with God. In this way, you will become ever more enthusiastic heralds of the Gospel. Your mission is rooted in the tradition of the Scriptures, especially the Psalms, which invite you to celebrate the Lord with the harp, to sing to Him and to praise Him on the strings and flutes (see Psalm 33: 150). Singing well requires commitment and good will, but it is a gratifying effort, because it elevates the soul making it more sensitive to the voice of the Spirit, especially when your chants are accompanied by liturgical celebrations, allowing the faithful a greater rapprochement and a deeper intimacy with God. So help to express joy, trust, repentance, love ... Singing is a language that leads to the communion of hearts; I thank you in particular because, passing every frontier, you spread a message of peace and fraternity. In the choir one experiences the joy and charm of polyphony. I urge you to be "polyphonic" even in everyday life, both among you and with others. First of all, keep in mind that, more than for the beauty of your songs, they will recognize you as disciples and witnesses of Christ if you love one another as He has loved us. Therefore you are called to be one heart and one soul. And towards others, remembering the pastoral care of your Founder on behalf of the poor and the circus, you can continue to welcome these people into your communities and families, listening to them, singing with them the "Gospel of the little ones". This is your way of being a missionary Church, capable of infecting and attracting those who wait, perhaps without knowing it, for an encounter with Jesus. I know that you often meditate on the words of Father Arione: "Walk to look for others, stop to find yourself". The smile of your faces, the freshness of your voices, the harmony of your songs, dispose yourselves to prayer and raise up in those who listen to you the true joy of life and hope in the future. With these wishes, I would like to renew the appreciation that the Church has for your apostolate and, while I entrust you to the intercession of the Virgin Mary and of Saint Cecilia, I warmly bless all of you and your loved ones. And please, remember to pray for me.